The Big Bang Theory might have revealed a new member of the Justice League... wait, what? Bazinga! Or maybe just plain old D’oh! That’s because – as Sheldon and the gang should know – crossovers rarely work. Case in point: an official Big Bang Theory tie-in may have just ruined who the newest hero to join the Justice League will be. Spinning a wheel on the Big Bang Theory sweepstakes here not only grants you access to a new Big Bang Theory clip (yay? ), but also a glance at the Justice League logos, hence the partnership. Leave it to Reddit to come up with the goods when it comes to something as weird and wacky as this. The wonderfully-named MuzzledPenguin has spotted one out-of-place logo that sticks out like a sore thumb… or should that be ring? That’s right. Alongside the logos for Wonder Woman, Batman, Superman (even though he’s dead and absolutely 100% never coming back), Cyborg, Flash, and Aquaman, is the iconic ring for Green Lantern. The logo doesn’t point out which Green Lantern might be rocking up and joining the team – though I’d love it to be John Stewart – but it’s as close to an official confirmation as we’ll get with the movie just around the corner. This isn’t the first time we’ve seen (or, rather, heard) about a possible seventh hero being a part of the Justice League. The soundtrack listing was previously leaked and it’s not hard to put two and two together to come up with four—I mean Green Lantern. He is one of the most iconic DC heroes, and his absence is pretty noticeable, even for most casual comic book fans. Need a quick Justice League fix? 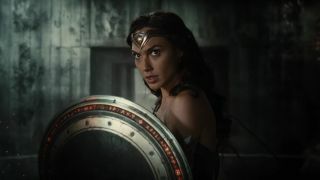 Test screenings have seen one superhero soar to the top of the popularity rankings – and it’s not who you might think. If that wasn’t enough, expect a more heroic Batman in the movie, according to Ben Affleck.